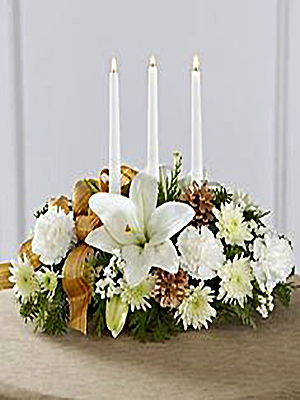 This elegant Christmas centerpiece blooms with winter-white holiday enchantment. What a lovely addition to grace your Family's Table. White hybrid lilies, carnations, chrysanthemums and statice are arranged and interspersed among holiday greens. Accents of gold pinecones, French wired ribbon and the warm glow of candles add the perfect touch of Holiday charm. Flowers and vases vary based on season and availability.